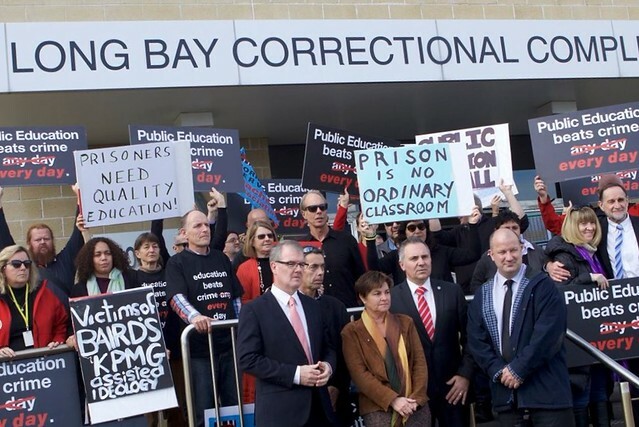 Teachers who work in NSW prisons are taking strike action because the Baird government is outsourcing prison education. Lowering educational standards by replacing qualified teachers with non-teachers will not help prisoners turn their lives around. High-quality education is essential for prisoners to develop the skills and motivation to gain employment and contribute positively to our society as law-abiding citizens. Click here to send an email to your local MP as well as Corrections Minister, David Elliott and NSW Premier Mike Baird. Sign the petition – follow this link to print a petition against these cuts. Circulate the petition around your workplace and follow the instructions to return to Federation. This is a formal petition to the state government that must be completed by hand, and we require 10,000 signatures for the matter to be debated in parliament. Former prisoners and current teachers in NSW Corrective Services sceptical of how outside providers will succeed in delivering effective education to NSW inmates spoke out at a public forum at NSW Parliament House earlier this week. The NSW government plans to abolish 138 of the 158 qualified teacher positions in gaols, re-classifying some of these jobs as clerical and opening up prison education to private providers. It is not in the community's interest to have people leave prison without a chance to be skilled and have the chance to break the poverty and crime cycle that has put them in there in the first place. That was the message delivered by Federation President Maurie Mulheron at a public forum at NSW Parliament House on Tuesday night. Mr Mulheron said Federation would not tolerate the government's decision to abolish 138 of the 158 qualified teacher positions in gaols, re-classifying some of these jobs as clerical and opening up prison education to private providers. In May of 2016, the NSW government announced that of the 158 educators working in Gaols, 138 were to be made redundant and replaced by clerical staff, and for educational program content to be outsourced to an outside provider. The Teachers Federation is campaigning against this move, and there have been protests and rallies at many gaols across the state. We are now calling on all union members to show support for their colleagues teaching in Gaols by participating in a Day of Solidarity on Thursday, August 11. Federation members should hold a meeting to pass a motion in support of our Gaol colleagues. – a sample motion will be emailed to all Fed Reps and Workplace Committees on Monday 8 August. Click here to send an email to NSW Corrections Minister, David Elliot, to protest the government’s decision. Get this petition to Parliament! Federation is taking the significant step of petitioning State Parliament to reverse its decision to end high-quality education in NSW gaols by sacking large numbers of teachers – hard-working Federation members. Please fill out this form to send a message to the Corrections Minister, David Elliott, asking him to maintain public education in the prison system. What price education in gaols?